My husband and I differ when it comes to favorite seasons. I'm more partial to spring with its hundreds of shades of green and its abundant flowers. Mike, on the other hand, is an autumn kind of guy. He likes the cool down after summer's heat. Our two kids? They haven't developed a favorite yet, so I set out in playful competition to bring them to the spring side. My master plan? Convince them through the wonders of South Carolina's Olde English District. So I scouted a few weekend outings and shared the details with the family. It doesn't take much to convince our daughter, Elle (12), to take a hike, and Russell (10) is drawn to the water. So, when they heard from the Catawba River Expeditions folks at the Lansford Canal State Park that we were paddling and hiking, they were all in. The crew outfitted us in kayaks, and we set out on our own up the river at a leisurely pace. Easy enough for beginners and exciting enough for advanced kayakers, paddling on the upper Catawba combines a bit of exercise with ample wildlife viewing. Blue kingfishers flitted above and around us. Mike remarked that when our kids held a paddle in their hands—instead of a phone—they noticed the smallest details. Soon, they were watching the sky to glimpse the resident bald eagles—perhaps this season's fledglings—and peering into the greening forests looking for deer. The first hour passed quickly and we circled back to begin our hike. 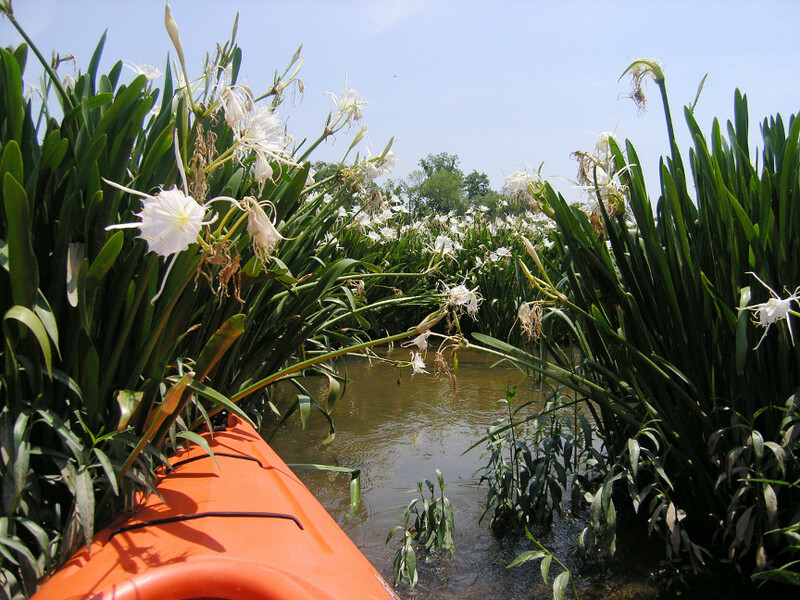 We followed the easy trail along the Catawba to one of the largest masses of Rocky Shoals Spider Lilies in North America. Both kids saw the tall white blossoms dancing in the breeze from a distance and ran off to see who could get there first—and to see who could take the best photos (Elle won that one). The lilies only grow amid swift, shallow water. They are a special treat to see since they're a rare species to begin with, and they only bloom in May and June. We topped off our visit by exploring the rest of the state park. Built around an 1820s canal, it includes a log cabin built in 1790, an old mill and a lock-keepers house. On the way home that evening, our car bubbled with conversation about the birds, flowers and the old mill. Another weekend, I whisked the fam over to the town of McBee to visit McLeod Farms for the annual Strawberry Festival (April 28th, 2018). 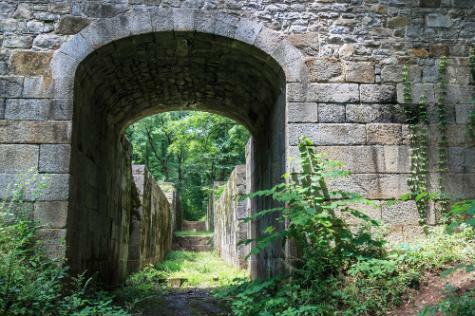 Run by the fourth and fifth generation of the McLeod family, their huge farm is the centerpiece of this old South Carolina railroad town. This Saturday introduces visitors to how fresh strawberries and peaches are grown and harvested. The McLeods don't bring in any outside vendors; this is just one family entertaining all the others. One of the ladies working there said, "We just want the children to play, listen to music and pick some berries." We set out in the fields with berry buckets to plop in the juicy red jewels. Russell ate as many as he picked. Afterwards, we had a family corn hole match (Mike won), and Elle sat for glittery face painting. We took a wagon ride out past the ripening peach trees, and listened to singer-songwriters croon. Hamburgers and hotdogs from the on-site restaurant satisfied our appetites before we were drawn to the sound of the old Hit and Miss Engine (an antique motor) that was connected to an ice cream churn—like chuck-a-chuck-a-pop-pop. Velvety strawberry ice cream tasted amazing. I even splurged on strawberry shortcake; it was a very good decision. 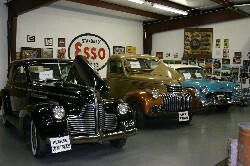 There's an antique equipment museum that displays old buggies, cars from every decade and ancient agriculture equipment. The kids tried to figure out the purpose of each piece and agreed that their washer machine was a vast improvement over a washboard and a wringer. We ran out of time to visit the Bush-N-Vine Farm over in York. This 150-year-old family plot welcomes families to pick strawberries and blueberries in the spring, peaches and blackberries in the summer, and pumpkins in the fall. When Mike heard that last detail, he raised an eyebrow at me with a sly smile. 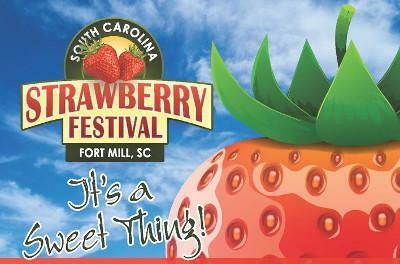 Another spring Saturday's bright skies set a perfect backdrop for a day in Fort Mill at the SC Strawberry Festival. Held annually on the first weekend in May, this is the kind of small town event that brings me a sense of excitement and nostalgia all in one. All manner of folksy events celebrates the season. The locals crown a Strawberry Queen, and there's a court of lovely lasses in satin sashes who we saw mingling in the crowd. There's a car show and a Pick ‘n' Flick—with strawberry picking during the day, and an outdoor movie at night. There are even pig races every hour where the queen kisses the winning pigs. Russell guffawed when she smooched the piglet. We wandered through a butterfly tent—one landed on Elle's arm—and joined the throngs cheering on the strawberry cake-eating contestants. Russell was pining to sign up, but we redirected his attention to the strains and twangs of country music from the Strawberry Jam Stage. There was even theatrical wresting going on, as well as a Ferris wheel, a carousel and more than a dozen other rides. Happily worn out back home, Mike and I talked over our weekends. "You may have a point about spring," he confessed. I kept my tiny fist pump to my imagination, and said, "Oh really?" "Mmhmm," he said humbly. "But how about we go back to in October for the pumpkin patch, corn mazes and paddling amid fall colors?" "Game on!" I answered with a laugh. Find your favorite season in Olde English District with outdoor fun.